"City Works" envisions Chicago's "dreams and nightmares" - Archpaper.com "City Works" envisions Chicago's "dreams and nightmares"
Drawing Detail of “Phantom Chicago” by Eisenschmidt: The city of Chicago generated through unbuilt visionary projects across the 20th century (from Loos’ Tribune Tower to Griffin’s Plan for a Better Chicago and Greg Lynn’s Stranded Sears Tower). From the abandoned foundations of the ill-fated Chicago Spire to the ghosts of would-be Tribune Towers galore, Chicago’s unbuilt legacy could rival the iconic skyline it actually achieved. 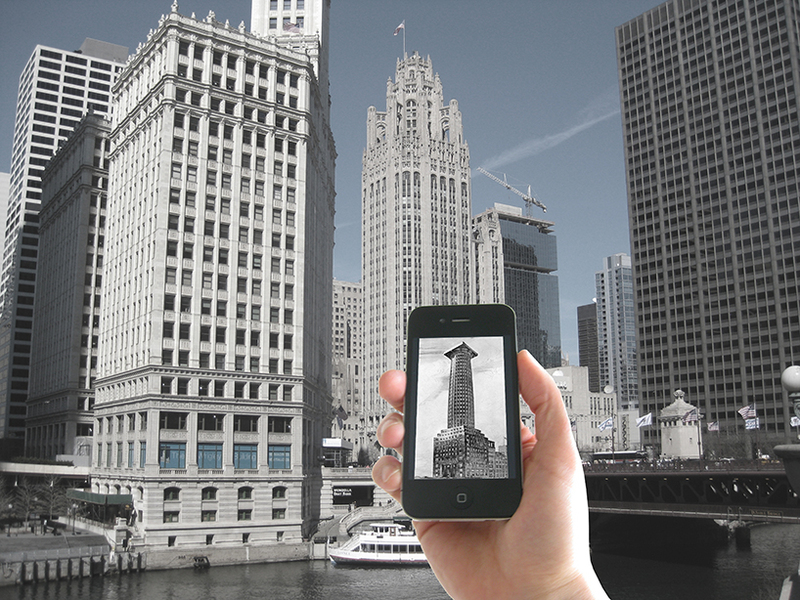 An exhibition on display downtown, dubbed City Works: Provocations for Chicago’s Urban Future, confronts the city with its alternative skyline in the form of a panoramic wall design and a “Phantom Chicago” iPhone app. The overall effect evokes “a dream but also a nightmare,” in the words of curator Alexander Eisenschmidt. It also presents “a series of urban environments that are typical for Chicago,” meditating through the work of four prominent local designers on some of the city’s contemporary challenges: waterways, industry, shelter, and vacancy. To borrow Eisenschmidt’s metaphor, the aim is to turn potential nightmares into visionary dreams. 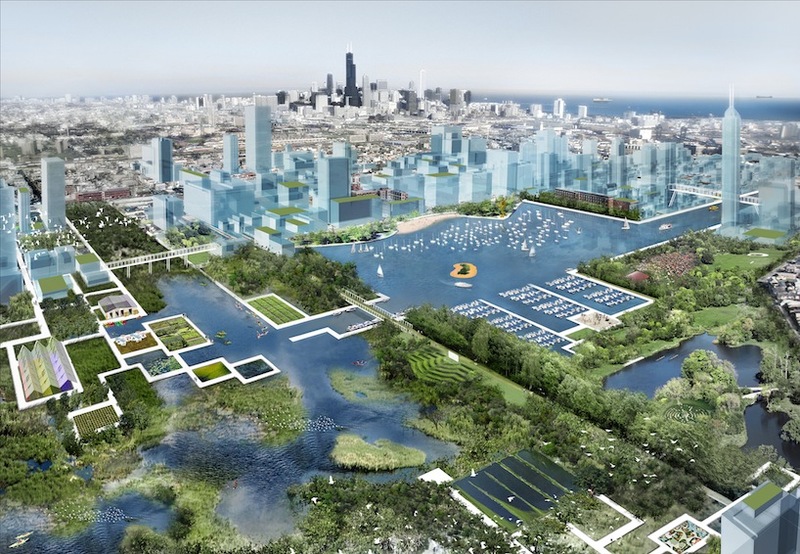 Drawing Detail of “Reclaiming the Edge” by Studio Gang: A vision for the future of the Chicago River through a series of freshwater inland lagoons. Studio Gang’s work on urban waterways is well-known and their work here, titled “Reclaiming the Edge,” reprises the vision they laid out in Reverse Effect and other publications: a riverfront community and restored natural habitat nourish each other in a kind of urban symbiosis. After years of legal wrangling, Chicago’s Water Reclamation District will soon disinfect the wastewater it dumps back into the river, signaling some substantive progress on water quality. Meanwhile the Chicago Riverwalk grows along the waterway’s main branch. Drawing Detail of “Free Water District” by UrbanLab: Free-Water-District: A shared megastructure-scaled public/private land/water partnership to revitalize the post-industrial landscape of the Great Lakes region. Drawing Detail of “Architoons” by Tigerman. 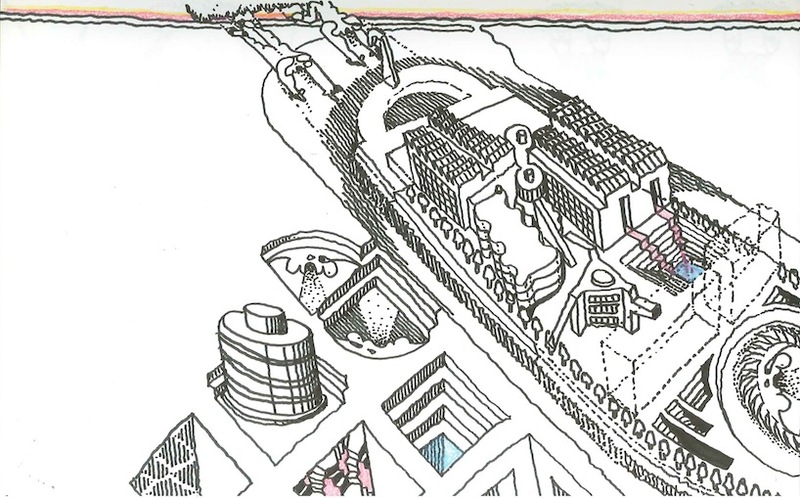 Stanley Tigerman offers a rumination on shelter in both the spatial and spiritual sense with “Displacement of the Gridiron with the Cloister.” His target is the “ineffable in architecture,” which is philosophical enough to mean many things to many people who might have very different ideas of the city’s urban aspirations. Drawing Detail of “Available City” by Brown: Development scenario across a Chicago neighborhood. “The Available City” by David Brown displays a similar yearning, manifesting the city’s 15,000 city-owned vacant lots as blots of color bubbling up amid fractured neighborhoods. 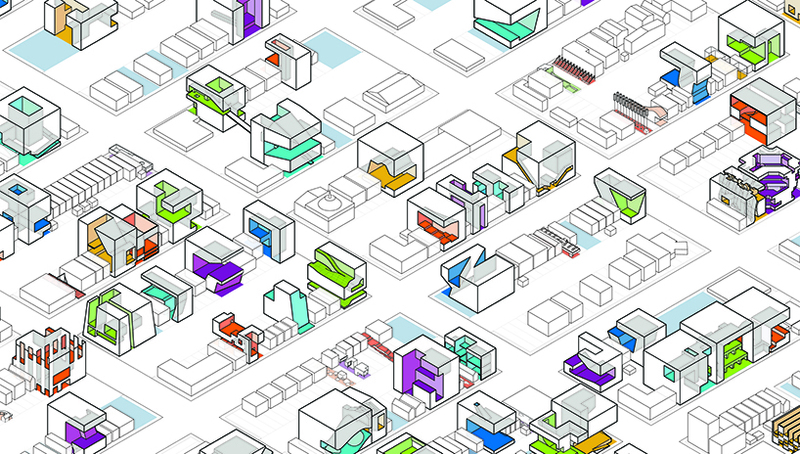 The bright colors, which appear to denote potential programs for unused space, could mean anything — adaptive reuse, public space, space-age capsule hotel — but the important thing is they reanimate dead spaces that total an area twice the size of the Loop. City Works, adapted from the 2013 Biennale in Venice, returned to its city of origin May 24. And these “provocations” are not Eisenschmidt’s first. In 2011 the University of Illinois at Chicago professor’s Visionary Chicago (reviewed here for A|N by Philip Berger) stirred conversation about bold building while the real estate market languished. The free show is open at Expo 72, 72 E. Randolph St., seven days per week through September 29.